Kampala, Uganda 13/4/2016: When we were little children, we were often warned not to play with fire. If we did not listen, two things were bound to happen; either we would get burnt, or the fire went out of hand and got wild, burning everything around us. If we got burnt, we learnt our lesson the hard way, but it the fire got wild, it appeared fun to watch and sometimes we’d try again in future! I personally watched a fire go wild, burning away a vast bush in my village some day. That little flame, once it spreads, can have devastating effect that is too laborious to halt or stop altogether. I recently listened to the American Ambassador Madam Deborah Malac as she passionately rubbished the just-concluded Uganda Presidential elections. She spoke with such fervor that one would think she’s the mother of this landlocked African nation. She spoke with total disregard of even the ruling of the Supreme Court of the land as if the world should only take her word as gospel truth. She spoke as if she cares about Uganda more than Ugandans themselves. Yet even if she’s only been in Uganda for a few months, Ambassador Malac’s comments about the country’s electoral process were utterly inexcusable. If I were in America making Ambassador Malac’s statements anywhere say in the small state of Illinois, I am sure I would have been welcomed with a chorus sounding like, “Who the hell do you think you are?” For one thing I know about Americans, they don’t give a damn. But being that Ugandans are known for their meekness, and considering that deep inside the Ambassador’s heart she could have silently been buoyed by the bullish feeling of “I am America”, allow me politely ask…And so what? This is Uganda, not America. Yes, the Ambassador acted to me like our childhood story about fire which I carefully used to open this article. On one hand you have a people that went to the polls, cast their vote and a winning candidate is declared. You have the same people recovering from the hectic election campaigns, currently going about their businesses. And on the other hand you have an American Ambassador, lighting a deadly fire discrediting the election as a sham. Once this fire gets onto people’s minds, with the backing of the ever bloody U.S Dollar, the outcome will be bloodshed and poor Uganda will come down crumbling. Sadly this is the kind of grim picture that America has created everywhere it has intervened, an opportunity to showcase her military might and to prove to the world that they are the super powers… And so what? Uganda is a sovereign country, and this sovereignty MUST be observed by whosoever wants to deal with Uganda in any way. We may not have taken enough strides to reach anywhere close to America, but the principle of non-interference in our domestic affairs is paramount, if we are to grow organically as a nation. America can bring in their Dollars if they have so much to spare, but the aid given for HIV/AIDS and support to NGO activities all over the place, should never be an excuse for putting the country at ransom. Who is America to insist on discrediting Uganda’s election when the entire bench of 9 Justices of the Supreme Court ruled that the outcome of the election was convincingly acceptable? Which candidate did America support anyway? The Ambassador seemed to be too obsessed about the delayed voting in Kampala and Wakiso, but says who that that’s all about Uganda? She also cries about the closure of social media. Well, I was personally affected, but I could understand government’s action on this considering the likely negative outcomes of an uncontrolled medium of communication. As a media practitioner, I know so well that freedom of speech must be responsibly enjoyed, which many social media users are not doing. And then the Ambassador is also concerned about the arrests of FDC flag bearer Kizza Besigye. Were the Ambassador in Gen. Kale Kaihura’s shoes, would she simply watch on as a losing candidate gathers crowds in the city? Then she’ll talk of freedom of assembly in total disregard of the responsibility of the persons assembling to respect the set guidelines of the police. I find all this very unfortunate to the very least. While I appreciate the need for a country to observe so-called human rights, these rights cannot always be seen from the eyes of the opposition and NGOs. It is not always necessarily true that ruling governments are rights violators and therefore should be fought. There’s got to be convincing reason adduced, which must pass the litmus test of national importance. People would want to believe that the elections were rigged and that the Electoral Commission displayed so much incompetence, but this must be of significant impact, which no one has been able to prove. Of course, this is not to say that everything was perfect. Thankfully the Supreme Court justices pointed out clearly the areas they felt needed to be polished for the future, including the impact of incumbency in creating an unleveled field. But even in football, home teams usually have an unfair advantage over the visitors, though this has never created any guarantees as we’ve seen home teams including the great Manchester United losing on their own home tuff. Perhaps on the African Continent, Nigeria’s Muhammadu Buhari would know so well how possible it is to dislodge an incumbent without firing a single bullet. His opponent in the last elections, Goodluck Jonathan failed to live by his name and even with state apparatus at his disposal, he caved in and was beaten convincingly. So it may not be true that Mr. Museveni is merely hanging onto power….what do you do if the man is still the people’s choice? So my dear America should be at peace and let Ugandans handle their affairs the Ugandan way. This is how we do it. Mr. Tumusiime Deo, my brother you have said it all. Wherever America sets foot, there has to be turmoil and confusion. Examples are Libya, Egypt, and many other African and Middle East countries and Ugandans are alert and will not accept any other country to run their affairs. Uganda is a sovereign country therefore should enjoy the independence and respect she deserves. What’s the fuss about the US ambassador stating the obvious and highlighting the rot we can all witness within our country? If Ugandans spent more time holding their leaders accountable rather than accepting mediocre service delivery and governance, we wouldn’t have folks commenting about the sorry state of our country. Tumwine, are you blind or are you part of the crew impoverishing Uganda. You have stated a lot of irrelevant issues. Every country that has been allowed to settle an Emabassy in Uganda has a say of opinion for the interest of its relationship with Uganda. If Uganda doesn’t want any foriegne comments she shouldn’t open her boarders for other country nationals to live within. The ambassador as a representative of the head of state has to interprete and comment on such important issues to offer a clear picture to her country nationals in US and in Uganda. In other words she is fulfilling her duty towards the country she represents. She is not supposed to play sheepy head for every thing Uganda does. All criminal regimes hate it when foreign nations point out the crimes that they are carrying out on their nationals, and Uganda is no different. The new American Ambassador is a breath of fresh air, who is telling the truth and not praising criminality, like previous Anbassador. 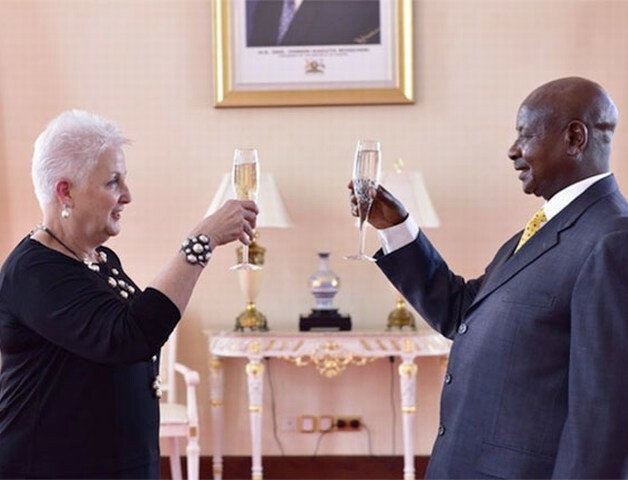 US Ambassador Debora Malac played with fire in Uganda exposing her total ignorance of Museveni the man. She gave life to Norbert Mao’s acronym FILTH = Failed in London Trying Here. Mao coined FILTH to describe global-western expats, who after a few weeks in Africa go on to speak of the continent like they are the experts and in patronising tones. “On one hand you have a people that went to the polls, cast their vote and a winning candidate is declared. You have the same people recovering from the hectic election campaigns, currently going about their businesses. And on the other hand you have an American Ambassador, lighting a deadly fire discrediting the election as a sham”!!!! Are you living in hell? On one hand, you have the majority of Ugandans who were disenfranchised and cheated in an election and on the other, are the untouchable goons that rigged the election taking the country down with them as get closer to their graves every passing year. Now, the former are voiceless and people like the ambassador speak for them. In other news, you must have been a very silly kid. How do you get happy when a fire is tearing your father’s banana plantation?